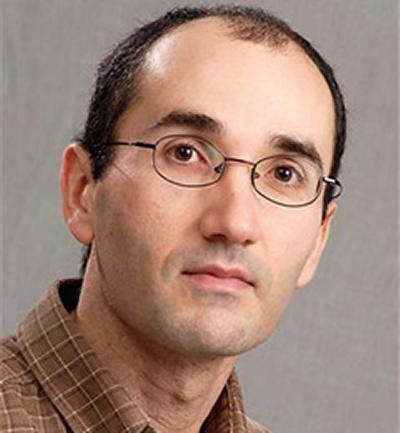 Ian Galea is an Associate Professor in Experimental Neurology within Medicine at the University of Southampton. He leads the Southampton Clinical and Experimental Neurology Team (SCENT), a multidisciplinary group of investigators studying inflammatory and haemorrhagic brain conditions. The team has laboratory expertise in cell culture, immunochemistry, molecular techniques and preclinical models, and clinical translational expertise in clinical assessment, diagnostic assays and neuroimaging. Bench-to-bedside science is translated to patient benefit. During neurological disease, brain tissue including vessels and blood within are destroyed, leading to inflammation, release of haemoglobin and blood-brain barrier compromise. This gets worse when there is infection and inflammation outside the brain. We study these pathological processes across a range of neurological diseases, such as multiple sclerosis and brain haemorrhage. His research concerns the brain’s immune system, and its response to infections, inflammation and haemorrhage, with implications for diseases such as multiple sclerosis and subarachnoid haemorrhage. As a clinician scientist he works across clinical and laboratory areas. He is a consultant neurologist with a specialist interest in neuroinflammatory disease. In his early scientific career, he studied cerebral perivascular macrophages at the blood-brain barrier and described a novel pathway of CD8 T cell entry into the brain. This formed the basis for his post-doctoral work, during which he studied the haemoglobin-scavenging system in the brain after subarachnoid haemorrhage and CD8 T cell-mediated brain disease. He was appointed to his current post in 2013. SCENT is interested in brain inflammation and the blood-brain barrier, with clinical relevance in two main disease areas: inflammatory and haemorrhagic brain conditions. The main aim is to improve patient lives after central nervous system disease by developing novel monitoring tools, outcome prediction algorithms and treatments. The team studies the molecular and cell biology of the interaction between blood and brain, in conditions such as subarachnoid haemorrhage and multiple sclerosis. Work is performed closely with patients in clinical studies to confirm the identity of key pathways that have treatment potential. The blood brain-barrier represents the interface between the brain and the circulation. In the normal healthy brain, systemic inflammation signals across the blood-brain barrier leading to changes in the brain itself. This effect is more marked in the presence of inflammatory brain diseases, the commonest of which is multiple sclerosis. The team studies the interplay between brain, blood and inflammation in health and disease, in order to be able to predict, prevent and treat brain inflammation. During brain haemorrhage there is a catastrophic breach in the blood-brain barrier. Blood is released into the brain, forming a clot. Unlike the rest of the body, the brain has a limited ability to deal with extravasated blood. As the blood clot degenerates, it leads to a local buildup of toxic substances. The team studies the effect of blood on brain cells and how this can be treated. Medical Research Council, Engineering and Physical Sciences Research Council, Multiple Sclerosis Society, Wellcome Trust, National Institute for Health Research, Alzheimer’s Research UK, The Gerald Kerkut Charitable Trust, Bio Products Laboratory Limited, Evgen, Merck-Serono, Spire, IQ Products, Peel Medical Research Trust, Royal College of Surgeons of Edinburgh, Association of British Neurologists, Wessex Medical Research, Smile for Wessex, University of Southampton. The brain is a delicate organ for two main reasons. The high density of neuronal connections means that a specialized microenvironment is required for optimum operation, relatively shielded from perturbations occurring in the rest of the body. Secondly, neurones regenerate less easily after injury compared to other cell types due to their molecular and structural specialization. The blood-brain barrier (BBB) has evolved to protect the brain, in parallel with increases in neuronal connectivity and specialization. The original concept of an absolute BBB is no longer tenable (Bechmann et al 2007). Instead, we have illustrated how the BBB is a relative, responsive and regulated interface between the brain and the blood (Galea et al 2007a). Hence it is more a blood-brain interface, than a BBB (Galea & Perry 2018). An interesting population of macrophages, identified by their surface expression of CD163, reside at the BBB, and has been the focus of our research (Fabriek et al 2005a). We have developed tools to enable study of cerebral CD163-positive macrophages including their depletion by clodronate-containing liposomes (Galea et al 2005) and their identification using mannose receptor immunohistochemistry in the mouse and human brain (Galea et al 2005, Fabriek et al 2005b). These macrophages scavenge particulate and soluble matter (Galea et al 2008), and remove toxic substances such as extracellular haemoglobin (Galea et al 2012). The BBB is responsive to systemic inflammation, such as that occurring during the common cold, vaccinations, major trauma or other inflammatory challenges (Varatharaj & Galea 2017). This is one of the ways in which the brain receives an advance warning of systemic inflammation. When the brain is already affected by inflammatory disease, such as multiple sclerosis, this responsiveness to systemic inflammation is heightened. We are currently improving methods of detection of subclinical systemic inflammatory activity using urinary neopterin. Our team is also studying how systemic inflammatory activity affects BBB permeability, using biochemical and magnetic resonance imaging (MRI) techniques. In particular we have validated a MRI technique which measures BBB permeability across the whole human brain (Varatharaj et al 2019). Since the commonest inflammatory condition affecting the central nervous system is multiple sclerosis (MS) (Galea et al 2015), this is a focus of the team’s research effort. MS is a primarily T-cell mediated autoimmune condition with significant contributions from other aspects of the immune system, including B cells and antibodies. The mechanism of the immune attack is different from that occurring elsewhere in the body due to the blood-brain barrier and absence of conventional lymphatics (Weller et al 2010, Weller et al 2015). MS affects young people of working age, causing neurological disability and loss of productivity. Diagnosis of MS is based on a neurological assessment and magnetic resonance imaging (MRI). In some instances a lumbar puncture is needed to examine the cerebrospinal fluid for evidence of antibody synthesis within the brain (Galea et al 2011), and we are working on an improvement to this test. People with MS find it difficult to adjust to their diagnosis and we have studied this phenomenon (Dennison et al 2010). One reason could be the uncertainty about prognosis, and we have found evidence for this in a qualitative study (Dennison et al 2016). To address this need, our group is studying how this can be improved using a web-based tool which enables a clearer definition of an individual’s prognosis by matching the individual with similar people with MS from a large database (Galea et al 2013). This is important since we have found in a large national study that the vast majority of people with MS would like more information about their long-term prognosis (Dennison et al 2018). Hence we anticipate that prognostication will gain increasing importance in the clinical management of MS (Heesen et al 2019). A number of treatments are available for MS, some of which we have reviewed (Ciccone et al 2008, Pucci et al 2011). We are also working on a novel treatment in MS, which augments the brain’s resistance to oxidative damage. Preventing infections may be important for the reasons mentioned above. In addition, we have found that systemic inflammation increases human blood-brain barrier permeability, which is detrimental (Elwood et al 2017). We continue to study the effects of systemic inflammatory activity on neurological diseases such as MS, and are now concentrating on finding potential therapeutic targets. In order to study MS, one needs to have a reliable measure of neurological disability. The most widely used measure is called the Expanded Disability Status Scale (EDSS) which usually relies on an assessment by a clinician. In an international project, we have compared patient-reported versions of the EDSS (Collins et al 2015), and are currently developing a mobile app-based version. Team members are studying an alternative way of measuring disability using triaxial accelerometry to continuously and remotely monitor physical activity. Although MS is the commonest inflammatory disease affecting the central nervous system, some of our team members are studying other less common inflammatory conditions (Irani et al 2010, Street et al 2014). We work in conjunction with the Wessex Multiple Sclerosis Service, based at the University Hospital Southampton NHS Foundation Trust, which looks after thousands of people with MS across a catchment area of 4 million people in southern England. Research active members of the Wessex Multiple Sclerosis Service and the Southampton Clinical and Experimental Neurology Team work together in a collaborative group called Southampton Translational Research in Multiple Sclerosis (STRIMS), which has a portfolio of clinical research studies. While studying the role of cerebral CD163-positive macrophages at the blood-brain barrier, CD163 was identified as the haemoglobin scavenging receptor. This led us to start investigating how the brain handles extracellular haemoglobin and its metabolites during haemorrhagic brain conditions. Haemoglobin is toxic to neurones. Cerebral CD163-positive macrophages are situated at the perivascular blood-brain barrier, in the meninges and in the choroid plexus, areas which come into very close proximity with blood clot after subarachnoid haemorrhage. Hence the macrophages are ideally located to scavenge cytotoxic extracellular haemoglobin leaching from the blood clot. We have published a review about this topic in Nature Neurology Reviews. We were the first to describe the CD163-haptoglobin-haemoglobin (Galea et al 2012b, Durnford et al 2015) and CD91-haemopexin-haem scavenging systems in the brain (Garland et al 2015). We showed that the brain has a reduced intrinsic ability to deal with extravasated blood. 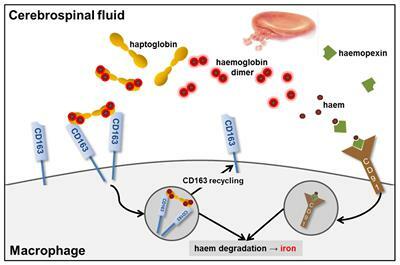 Although the blood-brain barrier allows two-way traffic of molecules and cells which helps, there is a significant delay, leading to an accumulation of extracellular haemoglobin in the cerebrospinal fluid, iron deposition and neuronal damage. Several members of the team are looking at how the endogenous scavenging molecules haptoglobin and haemopexin, may be useful clinically. Expression of isoforms with different activities and varying levels of expression may be useful to predict long-term outcome after intracranial haemorrhage (Gaastra et al 2018). Pharmacological manipulation of the levels of these endogenous molecules may be of therapeutic benefit. In order to identify novel therapeutic targets we are currently preparing for a large genome-wide association study (GWAS) of clinical outcome after subarachnoid haemorrhage. In order to facilitate this, we have founded an international consortium bringing together the best investigators in the field, the HATCH consortium. There are several types of intracranial haemorrhage, depending on where in the brain the haemorrhage occurs. In subarachnoid haemorrhage, there is bleeding in the subarachnoid space, over the surface of the brain. Up to one third of patients die instantly with this type of bleed, and most survivors have neurological and/or cognitive deficits. We have found that there is significant iron deposition in the brain, as demonstrated by histochemistry (Garland et al 2015) and quantitative susceptibility-weighted magnetic resonance imaging (Campbell et al 2019), up to six months after subarachnoid haemorrhage. A proportion of patients have issues with the way their brain processes sounds (central auditory processing), which probably reflects damage done to the area of the brain which performs this function (auditory association cortex) (Campbell et al 2019). There is only one type of pharmacological treatment which has been shown to ameliorate long-term outcome after subarachnoid haemorrhage – nimodipine. We are working on a number of new treatments, based on improving the brain’s response to haemoglobin. Some of these treatments are very novel, such as haptoglobin and haemopexin, requiring testing in the laboratory first. Others, such as sulforaphane, are being tested in patients. In these trials the long-term outcome after subarachnoid haemorrhage has been traditionally captured using measurement scales developed for head injury and/or stroke. We have worked with subarachnoid haemorrhage patients to develop a scale which is designed specifically to measure long-term outcome after subarachnoid haemorrhage (Pace et al 2018). The blood-brain barrier is not an absolute barrier to cells (Galea et al 2007a). A low-level influx of T cells into the healthy brain occurs as part of regular immune surveillance, to detect infection or tumours. We have described a novel pathway by which CD8 T cells gain access to the brain (Galea et al 2007b). This involves cognate interaction between the CD8 / T-cell receptor (TCR) complex on CD8 T cells and antigen-bearing major histocompatibility (MHC) Class I molecules on the luminal surface of cerebral endothelial cells. We studied the molecular interaction between CD8/TCR and MHC Class I further (Galea et al 2012a) and started working on models of human central nervous system diseases that are likely to be predominantly CD8 T cell-mediated. One such example is paraneoplastic neurological disease related to intracellular neuronal antigens. This occurs when a nascent tumour ectopically expresses antigens normally expressed intracellularly by neurones. The individual’s immune system is primed against this onconeural antigen. The onconeural immune response confers a favourable prognosis from the tumour point of view but causes neurological disease. The patient’s quality of life is affected as a result of neurological disability which is usually rapidly progressive and overrides the tumour as the major determinant of survival. Paraneoplastic neurological diseases are characterized by a T cell and humoral response. While both immune responses are damaging, it is yet to be conclusively shown which of these two responses are primarily responsible for triggering and maintaining disease. We are currently working to resolve this issue, with a view to designing effective treatments. Expert reviewer for the following international journals: Antioxidants, Brain, Brain Behavior and Immunity, Brain Research Bulletin, British Journal of Neurosurgery, Experimental Neurology, Histochemistry and Cell Biology, Immunology Letters, Journal of Molecular Medicine, Journal of Neurochemistry, Journal of Neurological Sciences, Metabolic Brain Disorders Multiple Sclerosis Journal, Neurology, Neuropharmacology, PLOS One, Patient Preference and Adherence, Scientific Reports. Gaastra, B., Ren, D., Alexander, S., Bennett, E. R., Bielawski, D. M., Blackburn, S. L., ... Galea, I. (Accepted/In press). Haptoglobin genotype and aneurysmal subarachnoid haemorrhage: individual patient data analysis. Neurology. Fabriek, B. O., Galea, I., Perry, V. H., & Dijkstra, C. D. (2005). Cerebral perivascular macrophages and the blood brain barrier. In E. de Vries, & A. Prat (Eds. ), The Blood-Brain Barrier and its Microenvironment: Basic Physiology to Neurological Disease London, UK: Informa Healthcare. Zolnourian, A., Galea, I., & Bulters, D. O. (Accepted/In press). Neuroprotective role of Nrf2 pathway in subarachnoid haemorrhage and its therapeutic potential. Oxidative Medicine and Cellular Longevity.